Bigfoot Evidence: Homo Gardarensis: An Ancient Hominid in North America? Homo Gardarensis: An Ancient Hominid in North America? Editor’s Note: This is a guest post by Jay of the Bizarre Zoology blog. For info on weird and amazing facts/theories of zoology, paleontology, and cryptozoology go to bizarrezoology.blogspot.com or follow him on Twitter. In the year of 1929, an archaeological dig near Gardar Greenland unearthed a bizarre discovery. A massive skull and mandible was discovered, and described by Professor F.C.C. Hansen of the University of Copenhagen. F.C.C. Hansen (a professor in anthropology) had noticed the peculiarity of these bones and felt that they were of a different species of human than Homo Sapiens. Hansen named this hominid "Homo Gardarensis" and related it to ancient human species such as the "Rhodesian Man" (Homo rhodesiensis). The great size of the Homo Gardarensis skull and mandible was said to be astonishing, and estimates put this hominid at possibly six feet six inches to seven feet tall! Because of this, the finds have also been compared to Homo Heidelburgensis (a European hominid which may have grown to seven feet tall). 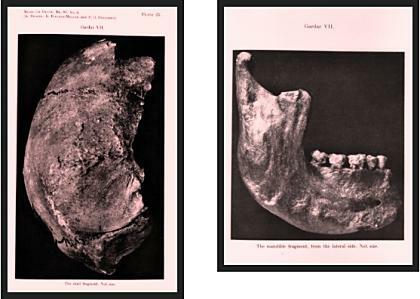 Claims of the Gardar mandible being larger than Homo Heidelbergensis jaws also exist, but it is unknown if these are valid or not. Click here to continue reading Homo Gardarensis: an Ancient Hominid in North America? Jay Monday, I'm digging Shawn trying to get BigfootEvi back to what it once was. Your article was very intriguing. Now if you ccould only talk Shawn into moderating the comments!!! Yes, by all means! Moderate the comments. First of all, Wikipedia is not reliable my friend :). That is the stance that mainstream scientists have taken. However, the man that made this judgement never actually studied the bones himself. Also, as I have shown, it is very evident that these are not simply the remains of a Homo sapiens with acromegaly, as the cranium is obviously very different than that of a Homo sapiens. Please actually read the article before you start making claims, it makes you look more intelligent. The self-correcting nature of science....in action! ah yea wikipedia and mainstream science aint reliable but your "according to random crypto dudes" is.right.have fun in your bubble. Interesting article, makes one really think. Have you ever realized that Wikipedia allows anyone to write things? And I am not saying that mainstream science isn't right, I am saying that they have accepted a possibly false opinion of Sir Arthur Keith. And I am not saying that Loren Coleman and Mark Hall (who are intelligent men that actually do research) are right, I just think there opinion is more likely. The only person to truly examine the finds in person was Professor F.C.C. Hansen, and he came to the conclusion that it was a novel hominid. He was a professor in anthropology he took the time to examine the finds, unlike Keith. I am NOT a bleever, and if you had taken the time to read my article then you would have realized that everything I write is supported by evidence or research by others! Agromegaly morpholgy can be fairly diverse and some instances can feature a fairly pronounced occipital bun, a skull even flatter than a Neanderthal's and even an occipital torus which all fits in with the H. Gardarensis specimen. Figure 3.2 has a lower jaw which is also rather similar to Gardarensis. Keep in mind that the Gardarensis specimen is only a partial jaw containing the 3 molars and 2 pre-molars and the front section is broken off. It seems to me that the Gardarensis skull could quite easily be a H. sapiens suffering from agromegaly. The extenuating circumstances of the burial (it was discovered in a grave in a 12th century Norse settlement, some sources say there were bodies with slightly similar features nearby) also make it highly unlikely that it was a displaced prehistoric hominid. @Jay I read your stuff when you gave the link for the better Neanderthal picks. Everything on your page was informative. As for the Anom pretending to be multiple people? Will you do us all a favor and get laid? Seriously this crap is getting old. Anonymous 10:12—Thanks for bringing that to my attention :)! I think that it's surely possible that the Gardarensis bones are really just cases of acromegaly. But please check out some of the other pictures in my article. The Gardar bones seem to not have an irregular growth, like other acromegaly cases. They also fit very nicely in a Heidelbergensis like skull. Also, notice that the skull in Figure 3.5 on that link has a jaw that is lowered very far and even points. That is nothing like the jaw of the Gardar Man. But thanks for letting me know your thoughts, and for arguing nicely and intelligently lol :). Also keep in mind that in the early 20th century every paleontologist and anthropologist was *desperate* to discover and name a prehistoric hominid. Certain skulls were classified and re-classified and argued over for decades and piltdown man wasn't debunked until the 1950s. The fact that Prof. Hansen declared it to be a new species of hominid isn't in any way conclusive. I guess Squatchologists will be arguing about H. Gardarensis for years to come until someone actually goes to the Panum Institute and physically examines the specimen under modern conditions. Someone get Jeff Meldrum onto that right away. But I have to say I hadn't heard of this case before and your article really gave me food for thought. Keep it up, I wanna hear more from you in future. Haha that's certainly true Anonymous: 10:24! That's very true, I just wanted to share the discovery. I originally didn't want to make the article cryptozoo logical, but I ended up doing it anyway. Thank you so much, that was my exact intention of writing the article, to give people something to think about. Thanks! Did they find bigfoot last night? Homo Gardarensis was the name affectionately given to the caps lock guy whose Spanish surname is Gardarensis. Ouch... That was mean of you (Anon 9:42) to put Jay in a bad light like that. Great article! Like this subject.